J ames Rousseau began his karate training in 1960/1961 and after training in Japan gained his Shodan in 1963. In 1966 he met Sensei Morio Higaonna and became hooked on Okinawan Goju-Ryu karate. He came to the United Kingdom in 1974, as a 5th Dan, and established two Dojos in Oxford before returning to South Africa some six months later. 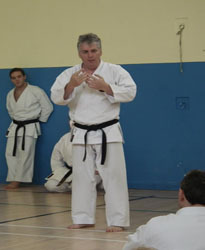 After Sensei James returned to South Africa, his brother, Peter, led the British Goju-Ryu Karate-Do Association (BGKA). BGKA was the forerunner of the English Goju-Ryu Karate-Do Association (EGKA) which was formed under the guidance of Sensei James Rousseau. In July 1979, along with Sensei Higaonna and Sensei Teruo Chinen, he founded the International Okinawan Goju-Ryu Karate-Do Federation (IOGKF) in Poole Dorset. Sensei James had taken a back seat in EGKA whilst he built his Chiropractic business and it was being run by Sensei George Andrews, Sensei Ernie Molyneux and Sensei Len Sim. The inevitable tensions, on Sensei James taking on a more active role, led to a split in the organisation and the formation of Goju-Ryu Karate-Do International (GKI) in 1993. The founder members of GKI included Senseis Len and Henrieheta Sim, Gary Weber, Paul Stiffle, John Boyle, Paul Coleman, Steve Thomson, Craig Nevitt, Blaise Mellise, Kevin Nason, Tim Cooper and Dave Thompson. 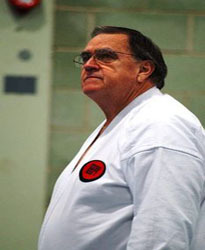 He began training in March 1967, and started Wokingham Karate Academy in 1984. Sensei Len Sim has practised for almost 40 years, after staring in Dunfermline. He trained in Chito-Ryu, Yoseikan (Shotokan) and Goju-Ryu and collected a few trophies along the way, including British Karate Federation Kata champion. He competed in the BKCC championships from 1973 to 1976 as well as captained two international tours to South Africa. After, he moved south to Havant and started clubs in that area, he met Sensei James Rousseau in 1974 and has been his student ever since. As a founder of the IOGKF, he spent many, many hours improving his Goju Ryu under Sensei Chinen and Sensei Higaonna. He opened the Wokingham club in 1984 assisted by Bill Cuzzocrea. Spin off clubs opened in Sandhurst, Owlsmoor and Sonning. 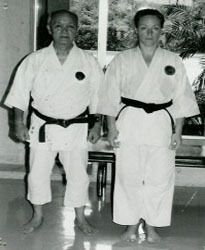 Sensei Henrieheta Sim is 7th Dan and has been responsible for the junior section of the club since she set it up in 1985. Henrieheta holds a bronze medal from the 1991 World Championships in Okinawa, Japan. I began training in 1975 in Booysens, Johannesburg, and gained Shodan in July 1985, at the IOGKF Gasshuku in Stellenbosch, South Africa, where I met my future husband. I moved to England and Sensei James Rousseau gave me away at our wedding in January,1986. As a qualified therapist, my skills as a teacher of karate are enhanced. I am qualified in a number of disciplines including Seitai, Kinesiology, Functional Biochemistry and Therapeutic Massage. Setai is Japanese Osteopathy and I spent three years studying it in Oxford from Sensei Tatsu Nakamura. He restricted his teaching to martial artists and was a 5th Dan Kyokyushinkai karate-ka and ex-Kyokyushinkai world karate champion. I started Karate training 1972 in the wave of new recruits because of the popularity of Bruce Lee. This was in SKI Shotokan style at Stanford-le-Hope Essex. Trained for a couple of years and had a break until I found Goju Ryu in 1980 and was taught by sensei Gary Webber at Basildon Essex. This was with the English Goju Ryu Karate Association (EGKA) headed by Sensei James Rousseau affiliated to the International Okinawan Goju Ryu Karate Federation (IOGKF) headed by Sensei Higgaona Morio. 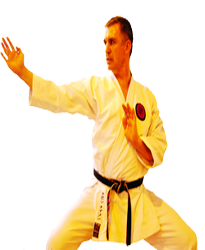 England Goju Ryu Team Member 1989 to 1994. 2nd Place Ind’ Kumite and 2nd Place Team Kumite at Miyagi Chojun World Championship San Diego America 1989. England Team and Individual medals at San Diego 1990, France 1992, England 1986 to 1994. Started Karate training 1972 in the wave of new recruits because of the popularity of Bruce Lee. This was in SKI Shotokan style at Stanford-le-Hope Essex. Trained for a couple of years and had a break until I found Goju Ryu in 1980 and was taught by sensei Gary Webber at Basildon Essex. This was with the English Goju Ryu Karate Association (EGKA) headed by Sensei James Rousseau affiliated to the International Okinawan Goju Ryu Karate Federation (IOGKF) headed by Sensei Higgaona Morio. After I gained my Shodan in 1987 graded by sensei James I trained regularly at the Camberwell Dojo called The Marble Factory and was taught by Sensei George Andrews. This was very hard training indeed and matched by the hardness of the students who trained there. But as those who know, this type of training really did make people gentler in character. I trained alongside very good karateka such as Linda Marchant and Felix Nelson and lots of others all just as good. I did help sensei Gary when he first opened the Chelmsford Dojo in 1984 and eventually took over the running of the Dojo in about 1986. The club eventually moved to its present location in 1988 and has run continuously since then. My first student to gain his Shodan was Jeremy (Jem) Pateman and the Second was Sensei Keith Bishop who has been a friend and sparring partner since when he attended the first training in Chelmsford in 1984. I have taught many children and adults who have achieved shodan and beyond, too many for me to mention here. We have also as a club raised lots of money in sponsored events such as Tommy’s appeal and Children In Need, which makes me proud. I am also now teaching a child of one of my first child students. Now that really is a scary thought about getting old! In 1994 Sensei Keith Bishop and I followed Sensei’s James Rousseau and Len Sim when the GKI was formed. The best thing about our association is that it is very friendly and everyone is made to feel welcome and is encouraged to be involved. I have been to many countries and places around this country and the world training with and meeting lots of friends and I would not have missed it for the world. I started my Goju Ryu Karate training in 1986 at Chelmsford Essex under Sensei Gary Webber. The running of the club was later taken over by my now close friend and instructor Sensei Kevin Nason. At this time we were members of the IOGKF and I had the privilege of training on many occasions with Shihan Morio Higaonna and Sensei George Andrews. In 1991 while still a member of the IOGKF I passed my Shodan (1st Dan). In 1994 Sensei Kevin and I joined the GKI and now have privilege and pleasure of training with Shihan James Rousseau, Shihan Arnold de Beer (South Africa) and Sensei Len Sim. In 1997 I opened a Karate club in Chelmsford where I teach children and adults a number of who have achieved their shodan. In 1999 I acheived 2nd Place in the individual Kumite at the GKI National Championships. In 2001 under Shihan James and Sensei Len I took and achieved my Yondan (4th Dan). In 2007 under Shihan James and Sensei Len I took and achieved my Gondan (5th Dan). In 2012 under Shihan James and Sensei Len I took and achieved my Rokudan (6th Dan). Through my Karate I have trained throughout the UK also in South Africa and Sweden. I really have made many good friends and it has been great fun.